Only in places like Mercer Island, South Seattle and remote parts of Kirkland has the median home prices been stagnant, everywhere else around the Puget Sound region has increased tremendously and in some places 18% or more. Places like Bellevue, Renton and much of the east side has seen dramatic 12% to 18% increases in home prices over the last year. In some cases, home prices have doubled as the amount of inventory has hit its lowest in 5 years. Back in February, the King County median single-family home price was $560,000, which was already up nearly 7% from January, one of the biggest one-month jumps in home price history since 2015. 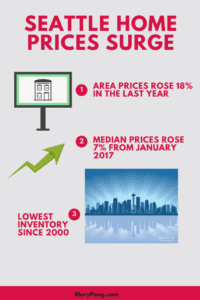 City suburbs also had a healthy bump as well with an all-time high set last summer but, prices have now nearly doubled over the last five years and both the Eastside and Snohomish County has set new price records. What’s the deal with all of this price increase? It comes down to inventory. There are simply fewer and fewer homes up for grabs, which makes competition fierce. King County has its lowest inventory point since 2000, some of the oldest records available. Ballard homes going on the market has seen 5 to 10 offers within minutes, most offering well over asking price. Buyers know that there’s just not much out there and because we are through the rush of spring and summer, homes might be coming down slightly or there simply might not be that much competition. In March, there were only about 1400 properties for sale across King County, down 25% from one year ago. Just two years ago there were nearly twice as many homes for sale but the market bottomed out 2011 where the county had six times more homes for sale than today. There are just fewer people selling their homes in normal and because sales go so quickly the absorption rate is extremely low. People don’t want to sell their house and have to turn around and buy a more expensive home unless they’re moving out of state or at least out of the region. Now, this is just for single-family homes. When we’re talking about condominiums, the number of condos for sale plummeted 42% compared to last year. There are less than 300 condos for sale in the entire King County; compare that with nearly 1000 3 years ago. The pipeline for new units in downtown has been drying up more and more over the last couple of years. And while there are larger buildings in downtown such as Luma, many of these homes are priced well over the $2 million mark, not affordable for most homebuyers. There are just not enough properties on the market to soak up the demand. This is a very competitive time and it’s important to have a real estate agent on your side that understands the market and knows how to negotiate. Competition for new homes and available homes are certainly high throughout our peak season this year. As of June 2017, for the eighth straight month, Seattle is the hottest housing market in the country. Many families are looking for starter homes but hit roadblocks because of rising prices and the fact that there are just not that many homes out there. Across the Seattle area homes are nearly 13% more this year than they were last year at this time with Portland coming in second on that list at just 9.3%. The last time home prices rose this quickly was back in October 2013 and we haven’t seen this level since 2007 and 2008, before the housing recession. Nationally, home prices are slowing a bit but not for the Seattle area. We are growing 2.3 times faster than the United States average. We have lead home price growth every month since September 2016. This is a tough market to be in as it limits homeownership for many families. The median price of a home in Seattle’s city limits is now $729,000 and $875,000 on Seattle’s Eastside, in cities like Bellevue, Kirkland, and Redmond. Prices are record highs in Snohomish County, Pierce, and Kitsap. In 2012, most starter homes were about one-third of a family’s income but now it takes about half of the family’s income to afford one of these starter homes, even one of the cheapest ones on the market. It’s not just the homes but the lack thereof. The number of starter homes of the market has dropped in half over the last five years. It’s scary to think that the average person would need to save about 14 years just to afford a 20% down payment on a typical small home, that is if they’re saving about 15% a month. When it comes to millennial’s, only 29% own Seattle area homes, one of the lowest in the nation. Young adults overall own only about 9% of properties in the Puget Sound. There is a bright spot, however. The typical summer slow down may be a great time for buyers to jump in the market. As we head into August, there are more homes on the market than there were just two months ago, easing up that spring rush, which is very typical this time of year. While the rest of the country is enjoying slowing rental prices Seattle is seeing none of that. Rents in Seattle keep climbing even though the city is getting a record number of new apartments and buildings. Tough luck Seattle; even though the rest of the country is finally enjoying an end to rent hikes, the Seattle area is not seeing any slowdowns. The Seattle and Puget Sound area rental prices continue to rise and are among some of the highest in the nation. Other places like New York and San Francisco are actually seeing rents drop while as the rest of the country is remaining fairly flat. But in places like King and Snohomish County, rental prices rose nearly 5% from December to June and grew an additional 7.6% from a year ago. These two counties now stand at an average of $1667 per month across all types of apartments, which is an all-time high. Rents are up 64% from seven years ago adding an extra $7700 to a typical renters bill. Hot neighborhoods such as Belltown, Ballard, and Capitol Hill are seeing 10% rent hikes from a year ago. Many buildings in places like San Francisco and San Diego are offering attractive vacancy rates and perks offered by landlords such as a free month’s rent, but you won’t find that in downtown Seattle. Most of Seattle apartment building rents are rising eight times faster than the national average. However, there might be a little bit of a bright side; these increases have slowed at least just a little bit from the peak increases over the past few years. Our rental growth last quarter was the weakest it’s been for the spring. Since 2013, albeit extremely small. So what’s the big deal? Why is rent so expensive in Seattle? First of all, we are undergoing one of our biggest apartment construction booms ever. We have had more apartments opening in the last five years than the previous 25 years combined. This added supply should alleviate some of the rental burdens. Tom Cain, the Apartment Insights Washington survey leader, expected the rate of increases to drop off a bit but has not seen as much of a drop as they would like. He predicts that the rent hikes will continue throughout the rest of 2017. We are also seeing red hikes in other places around Puget Sound including Tacoma and Everett. The greater Seattle area has led the nation in rent growth for the past 12 months in a row. This is primarily due to Seattle being one of the fastest-growing big cities in the country, bringing in multiple tech workers and generally well-paid jobs. This attracts a lot of different people and families especially from tech giants such as Amazon, Microsoft, Facebook and Google, which are all hiring. Plus, many of these people are choosing to rent first and buy later, which clogs up the rental market even further. So, where are the rents the highest and the lowest in the Seattle area? Rents are an average of $2400 in downtown Seattle followed by West Bellevue and the South Lake Union. Some of the lowest in the area include Burien, Mukilteo, Tukwila, SeaTac and Central Everett, where rental prices are below $1300 on average. So, what does this mean? It may be time to buy instead of rent and if you are looking to own a condominium that allows rental units or even a rental single-family home, it might be an excellent time to cash in on monthly cash flow. If you’re thinking you’d like to be in a home before school starts or before the fall, now might be a good time. The rush is over and many buyers that were planning to buy in the spring have already done so. If you are tired of losing out on every home you make an offer on it might be time to switch up your agents. Use an agent that is very familiar with the art of negotiation and getting the home her buyers want. Give Mary a call today for information on affordable homes in the area in which you want to live.